"The world must be made safe for democracy. Its peace must be planted upon the tested foundations of political liberty. We have no selfish ends to serve. We desire no conquest, no dominion. We seek no indemnities for ourselves, no material compensation for the sacrifices we shall freely make. We are but one of the champions of the rights of mankind. " 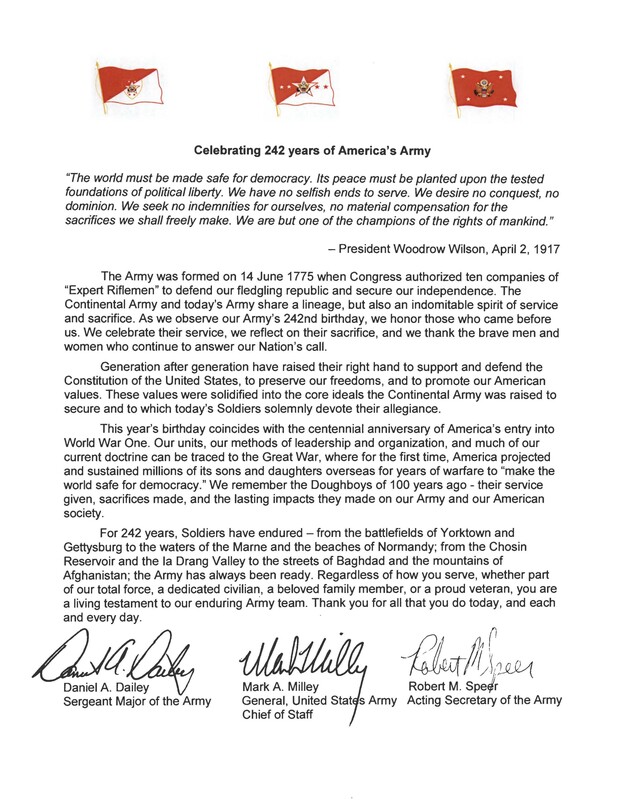 The Army was formed on 14 June 1775 when Congress authorized ten companies of "Expert Riflemen" to defend our fledgling republic and secure our independence. The Continental Army and today's Army share a lineage, but also an indomitable spirit of service and sacrifice. As we observe our Army's 242nd birthday, we honor those who came before us. We celebrate their service, we reflect on their sacrifice, and we thank the brave men and women who continue to answer our Nation's call. Generation after generation have raised their right hand to support and defend the Constitution of the United States, to preserve our freedoms, and to promote our American values. These values were solidified into the core ideals the Continental Army was raised to secure and to which today's Soldiers solemnly devote their allegiance. This year's birthday coincides with the centennial anniversary of America's entry into World War One. Our units, our methods of leadership and organization, and much of our current doctrine can be traced to the Great War, where for the first time, America projected and sustained millions of its sons and daughters overseas for years of warfare to "make the world safe for democracy." 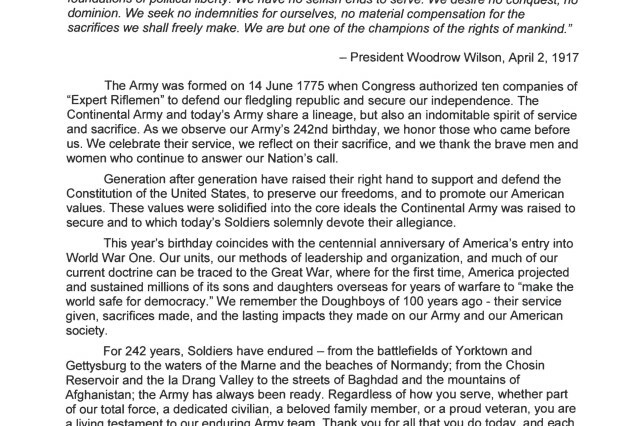 We remember the Doughboys of 100 years ago - their service given, sacrifices made, and the lasting impacts they made on our Army and our American society. For 242 years, Soldiers have endured -from the battlefields of Yorktown and Gettysburg to the waters of the Marne and the beaches of Normandy; from the Chosin Reservoir and the la Orang Valley to the streets of Baghdad and the mountains of Afghanistan; the Army has always been ready. Regardless of how you serve, whether part of our total force, a dedicated civilian, a beloved family member, or a proud veteran, you are a living testament to our enduring Army team. Thank you for all that you do today, and each and every day.